Amla/Gooseberry/Nellikkai is the tiniest berry known to humans which is a store house of all possible nutrients.It is the most powerful rejuvenating agent known to mankind.Mom and grandmom makes amla juice,amla buttermilk,pickle,candies,murabba and this amla rice is my favourite. Amla is said to have 5 out of the 6 tastes. It is rich in Vitamin C and an AMLA a day will definitely keep you away from seasonal infections.I prefer this form of amla intake for babies than all the above. Let us see in detail about the benefits of this miracle fruit after checking out the recipe. 1.Cook rice and fluff it up with a fork and set it aside. 2.Wash goose berries and grate it well. 3.Chop shallots and green chillies. 4.Heat a pan and dry roast the peanuts. 5.Cool them and peel the skin and set them aside. 6.In the same pan,add oil and temper with mustard seeds,urad dhal,green chillies,channa dhal and curry leaves. 7.Now add the chopped shallots and saute well. 8.When they turn soft add the grated amla/gooseberry. 9.Saute till they turn non-sticky and add the roasted peanuts when you are about to switch off. 10.Mix them well and let it cool. 11.Add salt and the mixture to rice and mix well evenly. 12.Serve it with any deep fry. Adjust green chillies as per your choice. You can skip peanuts for babies. Skip salt and green chilles for babies below one year. Please have a word with your doctor before introducing any new food to your baby. This can be given from 6 months but do consider your family history of allergies and also consult your doctor. This can be an excellent healthy option for lunch box menu and travel menu. It is high in Vitamin C and it is known for improving immunity and helps you fight all infections. It protects your liver ,heart and digestive system. It is a very good laxative and it cures diarrhoea,gastric problems,burning sensation. Amla helps in nutrient absorption to a great extent. It improves digestion as it has lot of fibres. The Vitamin C content helps in absorption and assimilation of iron. It improves appetite and aids in digestion too. It regulates the urinary system. A very common special dish which would occupy any event/gathering. It is dish from my native.The way it is prepared is so unique in my family. This dish needs utmost care while cooking. A recipe which can be an universal accompaniment and an awesome baby food post 8 months too. It can be a side-dish for idly/dosa/appam/idiyappam/rice. Do read the entire recipe along with the points in P.S: and getting into real cooking. 1.Extract coconut milk three times and keep them in separate vessels. 3.Add shallots followed by all veggies and Saute them well. 4.Add the third milk to cook the vegetables. 5.When the vegetables are cooked almost ,add salt,turmeric powder,ginger+green chilly paste and give a quick stir. 6.Reduce the flame at this point. 7.Add the second milk followed by first milk and mix the well. 8.In no time after mixing,switch off the flame. 9.Temper mustard seeds,urad dhal and curry leaves. 10. Add tempering elements and garnish with coriander leaves and serve. Reduce the quantity of chilly when you make for babies. Adjust amount of chilly as per your taste. The original recipe has a strict rule that only the first milk of coconut should be added. If you would wish to cook so, cook all vegetables in water in step 4 and add only the first milk and quickly turn off the flame. If the coconut milk boils ,it will get curdled and the entire would get into trash. Hence be sure to use diluted third milk to could vegetables or use water to cook vegetables. The milk shouldn’t get boiled after step.7. Cook the entire dish in medium flame. Do not over dilute coconut milk. It will turn the dish too bland. The fresher and richer the coconut is,the tastier the dish is. It can be used for a day if you store it in refrigerator. To use it for more than one meal in a day separate it in different vessels for each meal and store. Few add corn flour/bengal gram flour mixture to this dish. It might spoil the original taste and flavour of the dish. I dont prefer such ingredient addition. 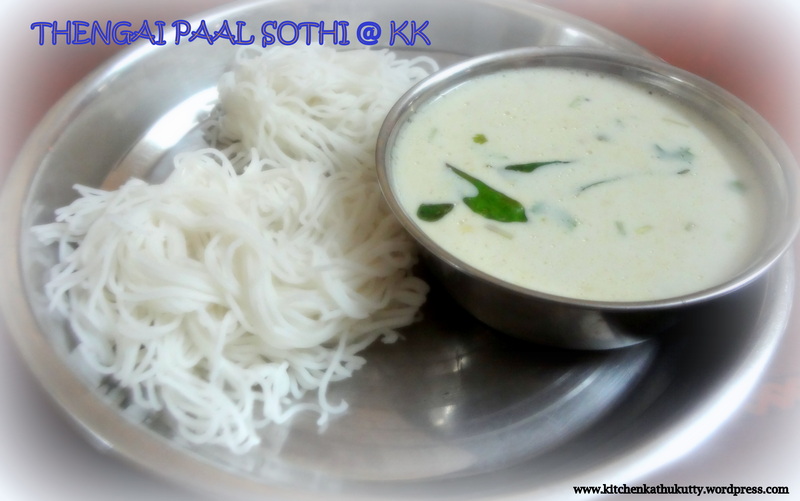 Ginger thuvayal+Sothi+Rice/Porikadalai thuvaiyal+Sothi+Rice/Keerai Kadaisal+Sothi+Rice are lovely combos. I have already posted seppankilangu more kulambu,a typical recipe from mom.Here is another version which was my first attempt.The first version of more kulambu which I tried by referring the web is as follows. Wash and cut the ladies finger into 4 pieces each. Dry it in hot sun for an hour. Dry roast urad dhal,channa dhal,cumin seeds and grated coconut. Add green chilly and water and grind it into a fine paste. Meanwhile make around 1 and 1/2 cups of butter milk out of the curd and add salt. Mix it well and set it aside. 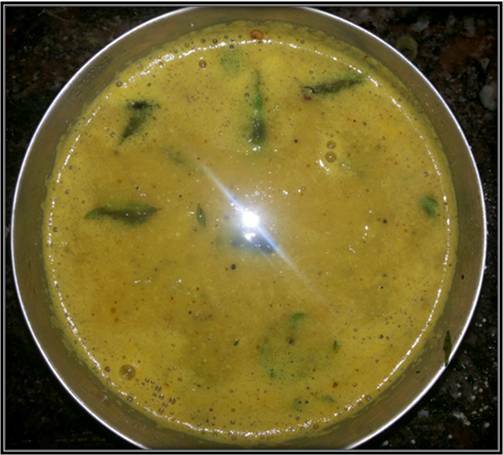 Heat oil in a kadai and temper with mustard seeds,urad dhal and curry leaves. When tempering is done,add ladies finger pieces and saute well until the stickiness disappears. Add the ground paste,hing,turmeric powder along with ladies finger and cook with water. When the ladies finger is cooked well add the buttermilk+salt mixture already prepared. Switch off the stove when the mixture is heated. Do not let it boil. Drying ladies finger in sunlight will help in removing the sticky nature of ladies finger. Instead of dry roasting you can soak chana dhal and grind it into a paste. You can add red chilly instead green chilly if you wish. Do not allow buttermilk to boil.The buttermilk will curdle and spoil the entire dish. You can add any precooked vegetables like brinjal,bottle gourd,plantain pith,colocasia instead of ladies finger. To enrich the dish garnish with chopped coriander leaves and fried vadagam. An interesting ingredient that could be added instead of any vegetables would be paruppu urundai/paruppu vadai. Yet another recipe from my MIL and myself and my husband tried it out first time hearing her recipe over phone. This is an excellent option when you are left with no vegetables at home or bored of cutting veggies. It happened to a successful attempt and I still can’t believe how it turned it out be so yummy. Soak both the dhals together for 2 hours. Drain the water completely and grind it into a slightly coarse paste by adding red chilly. Add half of the chopped onion,grated coconut and salt to it and set it aside. In a mixing bowl,add turmeric powder,hing,salt,sambhar powder to tamarind extract and mix well. Add oil in a kadai,heat it and let mustard seeds splutter in it. Add chopped onion and tomato and saute. When tomato turns mushy,add the mixture made with tamarind extract and let it boil. In the meantime,make tiny balls out of the ground paste and set it aside. When bubbles arise,add these balls slowly one after the other. Cook in medium flame until the balls get cooked. Garnish with curry leaves and serve it hot with rice. While grinding the dhals be careful in adding water. The size of the balls should be compatible enough to get soaked in the curry. So roll the balls accordingly. Adjust the count of red chillies as per your taste. The balls will turn soft when they are cooked. A very apt dish to have when you suffer from cold/cough/congestion. The dried ginger and pepper used in this will give a huge relief from your suffering instantly. And as it is home made it will definitely have no side effects. Dry roast all ingredients given under “To dry roast and grind”. Add little water and grind them into a fine paste. In a kadai,add oil and heat it. Temper with mustard seeds,urad dhal and curry leaves. When tempering is done, saute shallots and garlic. When shallots turn soft add hing ,salt and turmeric powder. Add the paste ground and mix it well. Let it boil until shallots and garlic is cooked. Now add the tamarind extract and let it boil for five minutes. The very first chettinad style food I tried. My husband gave me this recipe and I used lobia/thattapayaru in a lunch menu instead of a sundal. It came out so well that I started drooling when cooking was done. It goes well with steaming hot rice and chappathi. Wash and soak lobia overnight. Pressure cook lobia and set it aside. Heat oil in a kadai and all elements to temper. When tempering is done,saute shallots,tomato and garlic. When tomatoes turn soft ,add turmeric powder,hing ,sambhar powder,red chilly powder and coriander powder. Give a quick stir and let it boil. When bubbles appear as it boils,add tamarind extract and cooked lobia. Mix it well after adding salt and let it boil. After 10 minutes,grind coconut and fennel seeds and add to it. Switch it off when it starts to boil. Karamani/Lobia/Thattapayaru has to get cooked well. The more the kulambu boils after adding tamarind extract the more the flavour is. My Mother In Law’s recipe of kara kulambu is as below. It sees so simple but it will surely tickle in your tongue for hours.If you love a spicy menu in your lunch give a try. Heat oil in a kadai and temper with the above mentioned items. Add onion,tomato,garlic one after the other and saute it well. When the onion turns translucent add hing,turmeric powder and sambhar powder. Add half cup of water and let it boil. When it begins to boil add tamarind extract and salt. Mix it well and allow it to boil. Let it boil until it thickens and oil separates it out as a top layer. The more the kulambu boils the tastier it is. Karunai Kilangu also called as pidi karunai is one type of yam. It is a part of our weekly menu in my native and when I moved out of it I rarely found it. It is also called senai kilangu in many parts.I remember the debate we had in our lunch table among my beloved friends Joe,Franky,Harini,Senthil and Subash for this vegetables name. Lovely people and lovely days 🙂 I love this vegetable because I have learnt that this is the only type of which does not produce much after effects wrt. to gastrics and it also increases your immunity. Grandmom wrote this recipe by herself and sent it across through mom. The very first time I tried “Vatha Kulambu” was when I had no choice to cook for lunch. Wash and cook Karunai Kilangu in pressure cooker. Dry roast and grind ingredients to be ground and set it aside. Heat a kadai and temper with mustard seeds,urad dhal and curry leaves. Add the ground powder and saute well by adding more oil. Now add the cooked veggie and add little water. Add salt,hing and turmeric powder. Let it boil and add tamarind extract after 5 minutes. Keep stirring and let it boil until the oil added separates and floats above. You can cool this and store it a container and use it for a week. We mix rice with porikadalai thuvayal and then add this kulambu. You can add brinjal,drumstick,sundakkkai vathal instead of karunaikilangu. The vegetable should not get mashed. If you prefer drumstick or brinjal ,saute it well with the ground powder and cook with enough water and add tamarind extract . Until I tried this curry for the first time I never wished to taste it. I hardly had it in hostel when left with no choice. I first learnt this from mom and given below is her recipe. Later I found a version from Sharmis Passions ,modified as per my taste and tried that with ladies finger. Wash and pressure cook colocasia. Peel the skin,cut into 2 or 3 pieces and set it aside. Heat oil in a kadai and saute green chilly,ginger and garlic. Grind grated coconut,cumin seeds and fried green chilly,ginger,garlic into a fine paste. Make around 1 and 1/2 cups of buttermilk out the sour curd. 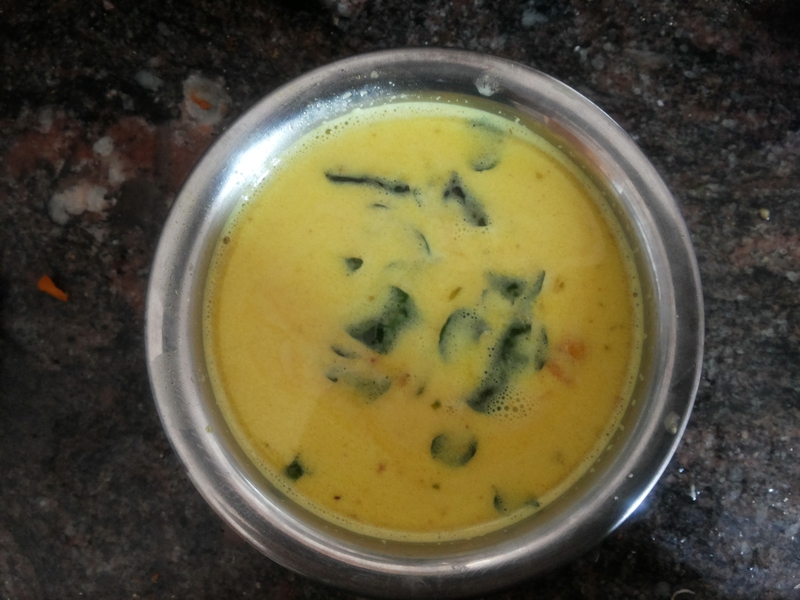 Add the ground mixture and turmeric powder to this butter milk and mix well. In a kadai ,heat oil and allow mustard seeds to spultter. Add urad dhal and curry leaves. Add the butter milk mixture to the kadai and just heat it in medium flame for 2 minutes. You can add any precooked vegetables like brinjal,bottle gourd,plantain pith instead of colocasia. A iron rich recipe which would go excellent with rice. Then add urad dhal,curry leaves,red chillies and fenugreek seeds. When curry leaves begins to crackle,reduce the flame because over toasting fenugreek seeds will add a bitter taste. Now add chopped shallot and garlic and saute in medium flame. When the shallots turn golden brown add hing and turmeric and give a quick stir. Add the chopped keerai(green) and saute well. Add around half cup of water and let the keerai get cooked. When you find the greens are cooked almost, add the tamarind extract and let it boil. Let it boil for 5 minutes and transfer to serving bowl. Porikadalai thuvaiyal is a excellent combination. You can add the greens without chopping too. To quicken the process,you can add the keerai after cooking it in a pressure cooker for 2 whistles. You can also do tempering separately and add it at last. The more shallots and garlic you add the tastier it is. Adjust the level of red chilly as per your taste. This recipe hails from my native and I never used to like it until I made it for the first time.Poricha Kulambu is the common name for this dish.But we call it pulilacurry(புளிலா கறி) in our home. It means curry without tamarind. (புளி இல்லா கறி). They usually make it when someone suffers from cold as the main flavour comes from pepper and cumin seeds.This is an unique and typical recipe from grandmom. You can add drumstick/snake gourd/board beans or cabbage instead of drumstick leaves. Wash the drumstick leaves well. Cook moong dhal in pressure cooker after washing and soaking it for 10 minutes. Take a kadai and dry roast all ingredients I have mentioned under “To dry roast and powder” by adding one after the other in medium flame. Add oil in the pan and temper with mustard seeds,urand and curry leaves. Now add the drumstick leaves and saute well by adding turmeric powder and hing. Add little water and cook the leaves. When it starts boils,add the powder which was coarsely powdered and give a quick stir. Add some more water and mix the mashed dhal to the kadai. Finally add salt and serve hot. If you wish you can add one red chilly when you temper to increase spicy level. The cooking time varies depending on the veggie added. You can also add the powder while you saute the leaves. This will give a rich flavour. This is a protein and iron rich recipe very suitable for someone who is down with sore throat,cold and cough.